This concrete house in Tel Aviv by Bar Orian Architects features vertical louvres that can be either rotated to filter light or slid open to reveal the windows behind. Designed for a couple and their three children, the residence is located in a neighbourhood in the north the city called Affeka. Tel-Aviv based Bar Orian Architects, led by Tal Bar Orian, chose the simple form of two board-marked concrete boxes stacked on top of one another as a reference to Brutalist architecture. The upper volume is slightly offset from the lower to create two terraces on either side of the property. "We purposely chose to not design it as a delicate and invisible element, but with a heavy-duty look that together with the concrete refers to Brutalist architecture from the 50s," the architects told Dezeen. Large openings in the facade that span from the floor to the ceiling and are fronted by vertical louvres set in box frames, which are made from strips of aluminium and Corten steel that have a dark red hue. The shutters are electronically controlled to enable the residents to rotate the louvres or slide the boxes along runners at the top to fully open the windows. This allows them to alter the amount of sunlight depending on the time of day. 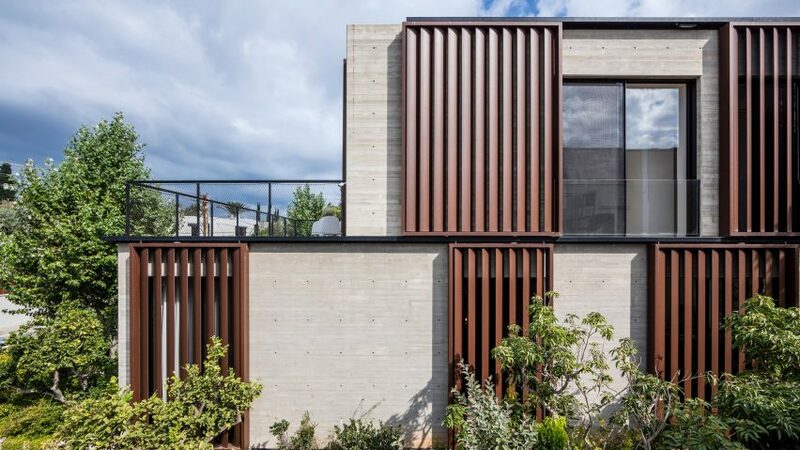 "The house was planned as a basic geometric structure – a combination of two raw-concrete boxes on top of each other," explained the architects. "Each box has seemingly random openings, and an external shading system that rotates and opens electronically, so that the dynamic facade change with residents' needs, the time of day, and the weather," they continued. "This system allows various degrees of light filtering, creating an additional layer that enriches the space and brings the tangible outdoors experience into the house." A pair of exposed concrete walls placed just off centre in the plan are used to divide each floor in two. The staircase, which leads to the basement and the first floor, is placed in between these walls, while rooms are set on either side. On the ground floor, polished concrete flooring provides continuity across the different spaces. One side is occupied by the open-plan kitchen, living and dining room, while a library and master bedroom is placed on the other. In the living area, oak cabinets run along the dividing wall, facing a long stainless-steel cooking island with a breakfast bar at one end. The lounge and dining room occupy the space in front, where sliding glass doors running along the rear wall open the dining and lounge to a covered patio. A metal black bookshelf is fitted on the other side of the exposed concrete wall to create a library and study nook. The master bedroom placed behind this features a large corner window with views to the front garden. The staircase, which features thick wooden treads, leads up the first floor hallway where a black banister with netting guards the opening of the stairs. Wooden boards cover the entire floor of this level, which is occupied by three children's bedrooms with access to a roof terrace. The bedrooms are also accompanied by white-painted en-suite bathrooms with white fittings. Bar Orian Architects was founded by Tal and Gidi Bar Orian in 1990. The firm's other projects include a bridge that is shaped like a pair of eyes. Other recently completed houses in Israel include a Modernist-inspired residence with glazed walls and cantilevered upper storey and a home built with concrete blocks among fruit trees.